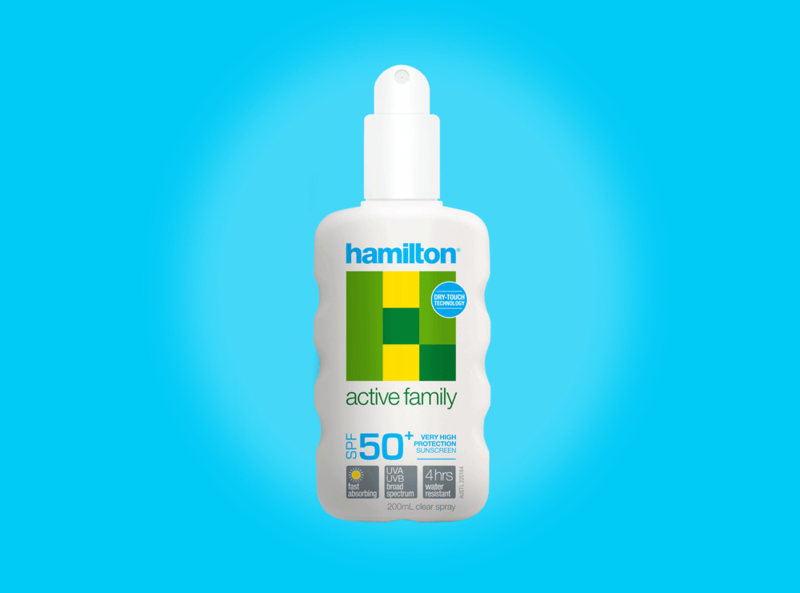 Hamilton sunscreens have been developed and manufactured in Australia for over 80 years and today our range of SPF50+ products provides very high protection to help your skin in Australia’s harsh conditions. In addition to using sunscreen it is important to wear protective clothing, wide brimmed hats and sunglasses when exposed to the sun. These measures can help reduce the risk of some skin cancers and premature ageing. Prolonged exposure to the sun should be avoided. Actives (w/w) Octyl Salicylate 5%, Homosalate 10%, Butyl Methoxydibenzoylmethane 4%, Octocrylene 8%. Preservatives Phenoxyethanol, Benzyl Alcohol, Hydroxybenzoates. DIRECTIONS: Shake well and apply generously 20 minutes before sun exposure. Reapply every 2 hours or more often when sweating, and reapply after swimming or towelling. Regular use may help to reduce the risk of some skin cancers. Prolonged exposure to the sun should be avoided. In addition to using sunscreen, it is important to wear protective clothing, hats and eyewear when exposed to the sun. Actives (w/w) Octyl Salicylate 5%, Homosalate 5%, Butyl Methoxydibenzoylmethane 4%, Octocrylene 8%. Actives (w/w) 4-Methylbenzylidene Camphor 4%, Ethylhexyl Triazone 3%, Butyl Methoxydibenzoylmethane 4%, Octocrylene 4%. DIRECTIONS: Shake well and apply generously 20 minutes before sun exposure. Reapply every 2 hours or more often when sweating, and reapply after swimming or towelling. Regular use may help to produce the risk of some skin cancers. Prolonged exposure to the sun should be avoided. In addition to using sunscreen, it is important to wear protective clothing, hats and eyewear when exposed to the sun. Preservatives Caprylyl glycol, Octanohydroxamic acid and glycerol. Actives (w/w) Octocrylene 3%, Butyl Methoxydibenzoylmethane 3%, 4-Methylbenzylidene Camphor 2%, Ethylhexyl Triazone 2%.